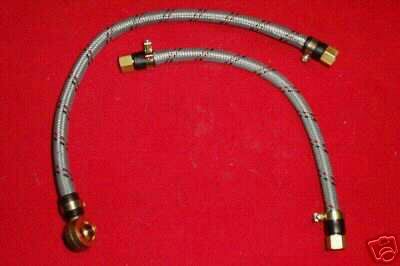 Short hose measures 12 inches, end to end. Long hose measures 15.5 inches, end to end NOT INCLUDING THE BANJO. These are much easier to trim for custom work than stainless steel...bibs cover the woven wire metal cover JUST LIKE ORIGINAL. This new item is show ready and Unleaded Fuel compatible. They are replacements for the OEM lines to carburetors, complete with OEM style bibs on the ends, and clamps...ready to install. We are the exclusive US distributor of this item.